For the Sega Master System and Sega Game Gear game, see Sonic the Hedgehog 2 (8-bit). 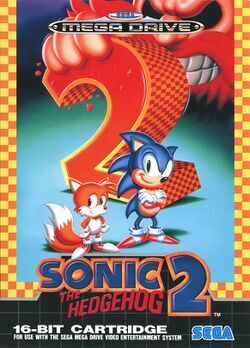 Sonic the Hedgehog 2 is a platform game developed by Sonic Team in collaboration with Sega Technical Institute, and published by Sega for the Mega Drive/Genesis. The game introduces Miles "Tails" Prower for the first time as a playable character. It is widely considered to be among the best and most influential Genesis games ever released.